When Black Panther hit theaters in February it took audiences by storm. Its impressive box office earnings are not the only thing that makes Black Panther a revolutionary film; it is also the first superhero movie to feature an all-black cast in the leading roles. Chadwick Boseman, Lupita Nyong’o, Letitia Wright, Michael B. Jordan, Winston, and Daniel Kaluuya are just some of the rising stars who shone on screen. The film’s off-screen ensemble reflects the diversity represented on the big screen. Ryan Coogler, known for Creed, co-wrote and directed Black Panther, while Hannah Beachler, Rachel Morrison, and Ruth Carter were responsible for the film’s stunning production design, cinematography, and costume design. The notable presence of African-American and female perspectives in the movie’s conception and screenplay resonated with audiences and contributed to the film’s unique outlook. When they designed the kingdom of Wakanda, Coogler and Beachler drew inspiration from the Mutapa Empire and childhood tales of Africa. By combining these sources with Afro-futuristic imagery and modern architecture, the two created a kingdom filled with lush landscapes, bustling cities and colorful tribes. Black Panther is an addition to the Marvel Universe that stands on its own. The film blends technological innovation with ancient traditions to create an African kingdom that is both mythical and recognizable. 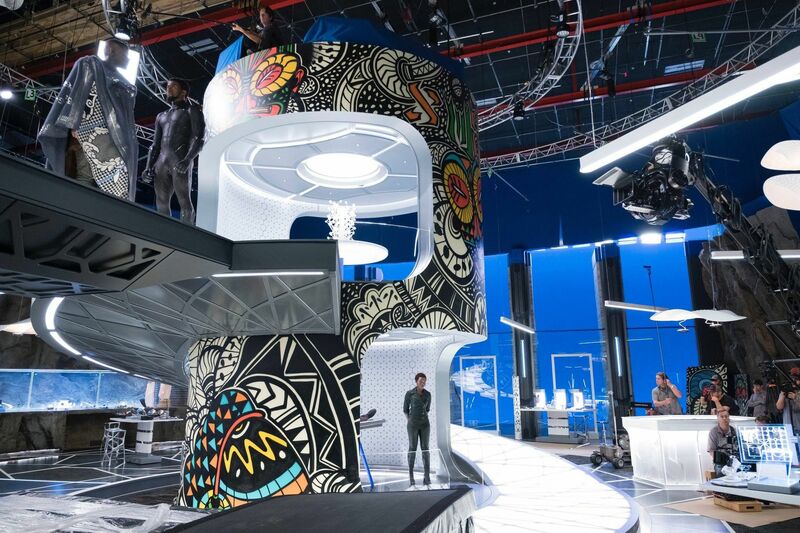 The scenes and environments in Black Panther are so convincing that most viewers will be surprised to see how the film was made. 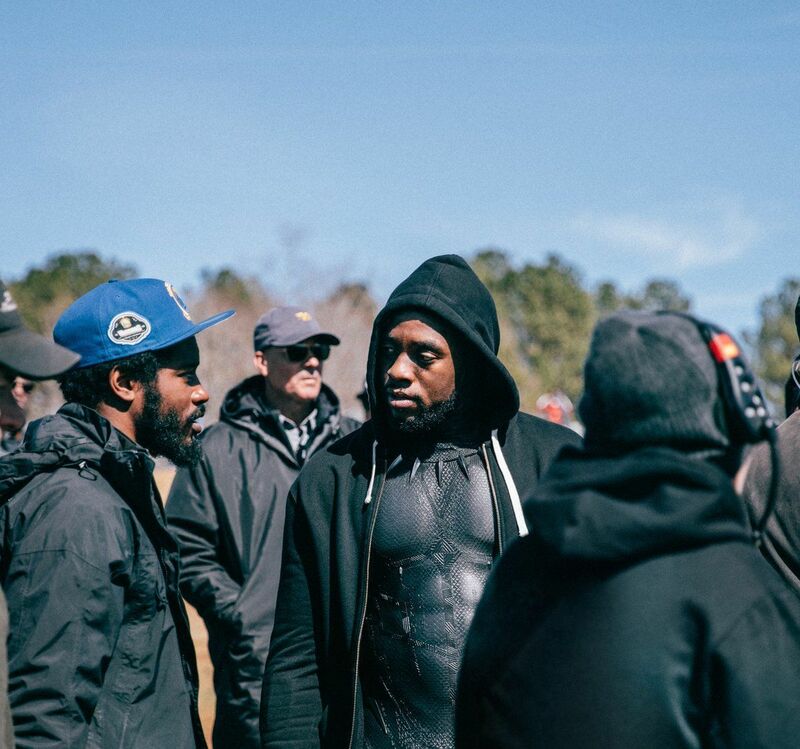 From prosthetic makeup to stunt men and blue screens, this list takes you behind the scenes to discover what went into the making of Black Panther. 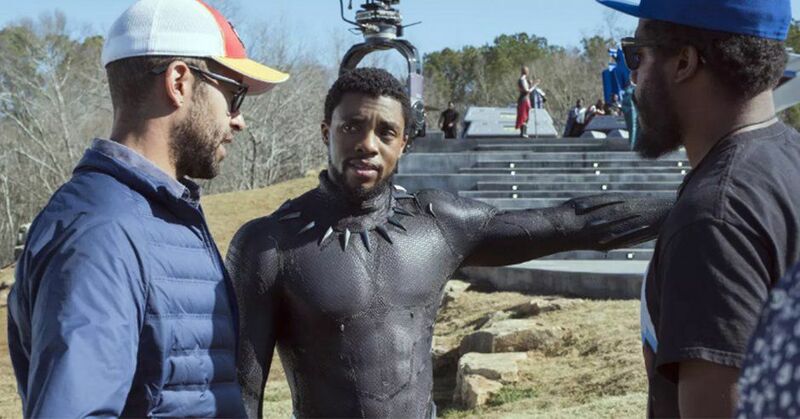 Here are 25 Behind-The-Scenes Photos From Black Panther. The first scene released from the movie was the instantly infamous fight in the casino. 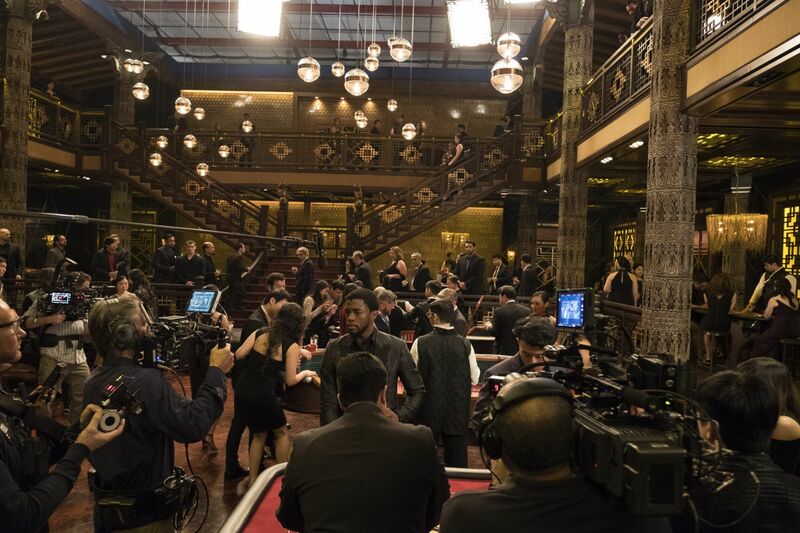 While most of the images you see in Black Panther are completed with visual effects, the casino scene is actually filmed on set without using any green screens. All the stunts and wreckage you see is real; the sequence only contains a small amount of computer graphics. 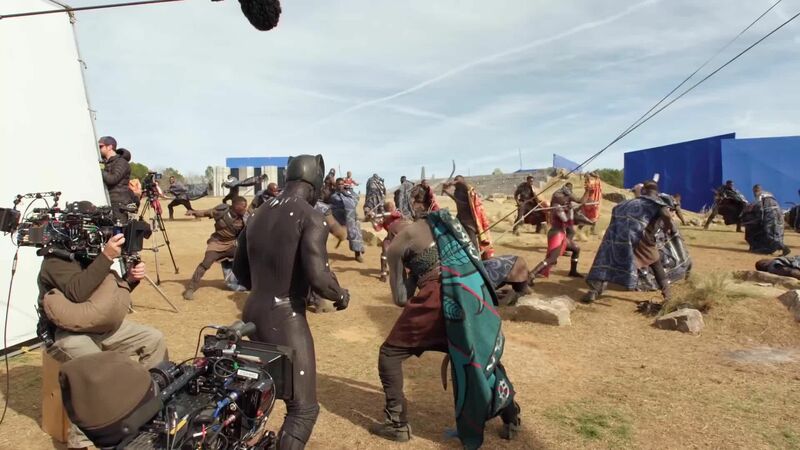 In the scene, T’Challa, Nakia, and Okoye are each wearing clothes in their own tribal color. Ryan Coogler has revealed that this was a conscious choice and that the combination of these colors represents the Pan-African flag. Shuri is one of Black Panther’s most lovable characters and a brilliant engineer. In fact, most of Wakanda’s recent technological innovations are the fruits of her inventive mind. Shuri’s lab puts the technological marvels of Wakanda on full display. Beachler put great thought into designing the lab and even added a swirling ramp as a repurposed piece of mining equipment. Fans of the film will notice that the high-tech screens lining the walls of the lab are completely blank. These were filled in later with digital displays that changed color according to Shuri’s outfit. 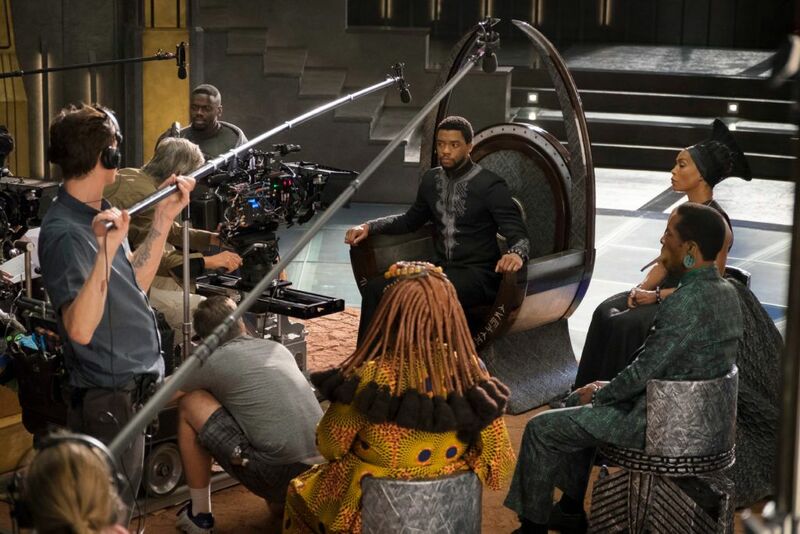 The council of Wakanda is where tribal elders meet to discuss national affairs with the king. It was during one of these meetings that Erik Killmonger returned to claim his right to the throne. This behind-the-scenes photo from the tribal council shows how the camera captures T’Challa’s imposing figure against a vacant backdrop. The Wakandan throne is an excellent example of how Beachler used curves to create a uniquely African atmosphere. 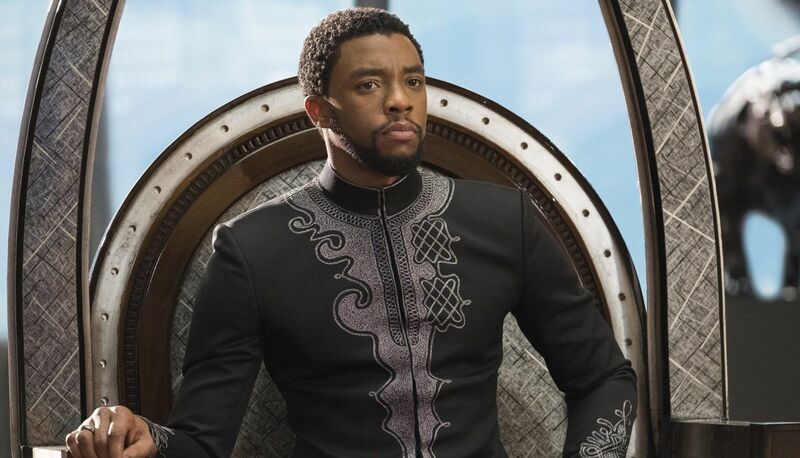 Critics have also noted that the throne frames T’Challa in a way similar to how Black Panthers leader Huey P. Newton was positioned for a portrait that celebrated his African heritage. 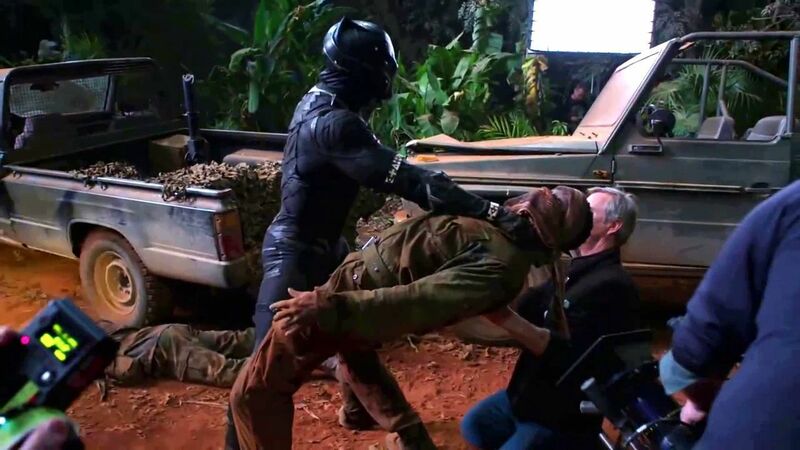 The battles that take place in Warrior Falls are among Black Panther‘s most exhilarating scenes. In this photo posted by Stunts Unlimited you see the complicated process that went into making these scenes. 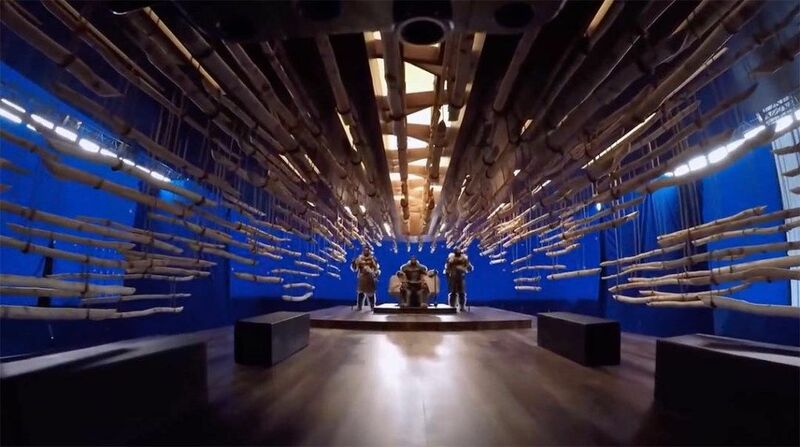 The set used for these takes took four months to build and measures 36 feet from top to bottom. The scene also features footage of Iguazu, a waterfall on the border of Argentina and Brazil. In addition to these real life recordings, the sequence was completed with animation by Scanline VFX . 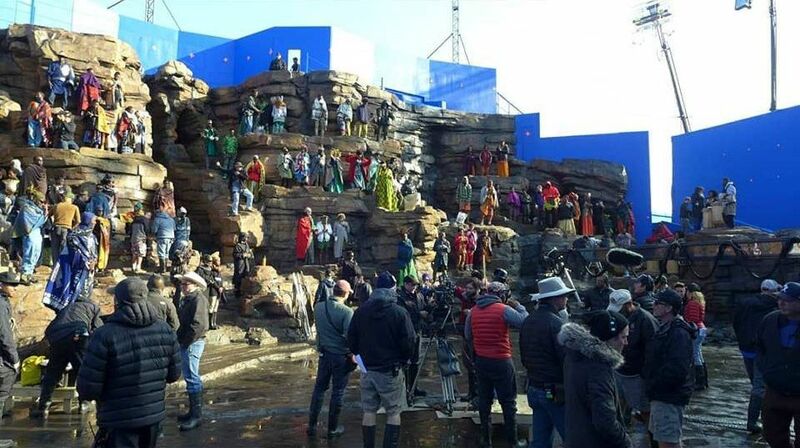 To keep them safe during filming, extras were secured to the cliffs with climbing gear. In Black Panther‘s giant battle T’Challa faces off against Erik Killmonger on the plains of Wakanda. T’Challa swerves in on his aircraft in the nick of time, and while he fends off Killmonger’s advances the fight quickly moves underground. The two Wakandan princes settle their scores on the railroad tracks of Mena Ngai, which culminates in a tragic ending for one of the two. Even though the landscape in this scene seems authentically African, the sequence was in fact filmed on Bouchaert Farms, not far from Atlanta. One of the most breathtaking environments in Black Panther is the Jabari tribe’s village. The timber structures of this town seem to grow out of the mountains and melt into the landscape. The Jabari are a tribe of carpenters who consider wood their Vibranium. This photography from the film reveals what a part of the village looks like without visual effects. The attention to detail on these sets is remarkable; constructors even hand-burned parts of the set to reflect how the tribe fortifies wood by burning it. 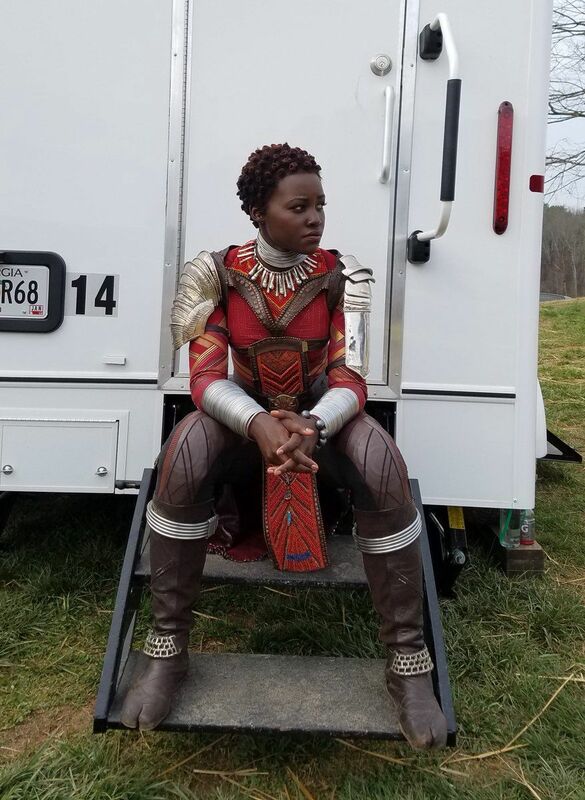 This photo shows an amusing contrast between Lupita Nyong’o’s elaborate costume and the sometimes trite reality of life on set. Acting in a movie is more often than not about getting up early, going to hair and makeup, and waiting around for someone to call you over. With these big-budget productions, audiences quickly get caught up in sparkling red carpet events and energetic press-tours. Photos like this one are a good reminder to viewers out there that the day-to-day life of a movie star can be quite boring and unglamorous. In a scene that recalls the incredible car chase from Tomorrow Never Dies, T’Challa and Shuri team up to steer a racing car through the streets of Seoul. 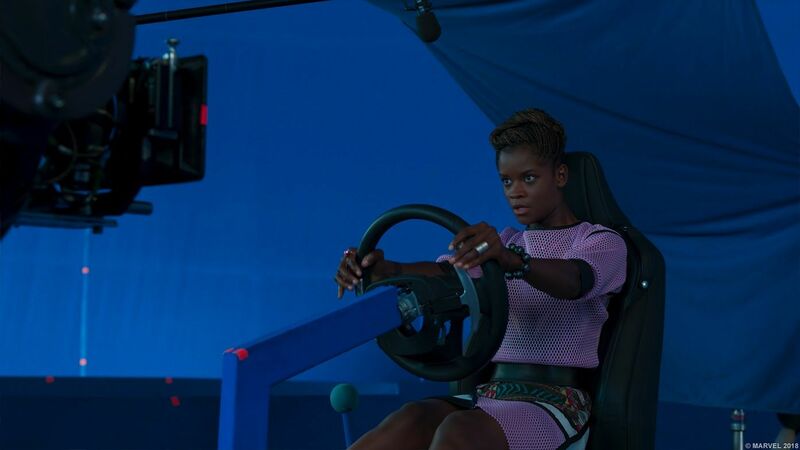 While T’Challa is fighting off bad guys, Shuri conjures up a driver’s seat from Vibranium. With the help of this new piece of tech, she can control a car on the other side of the globe from the safety of her lab. 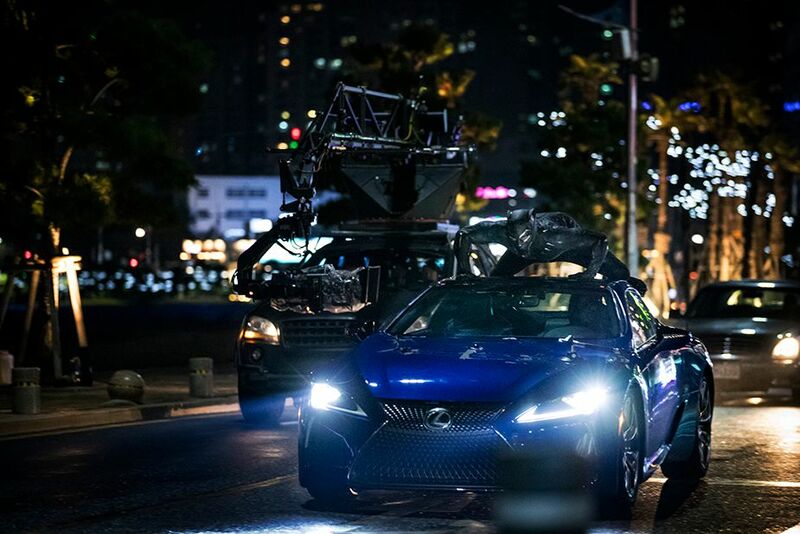 To create a sense of movement in this sequence, the streets of Seoul are actually projected onto the shell of Shuri’s vehicle. Like most modern films, Black Panther was made by combining on-location footage with CGI and footage from sets. In this production photo, we can get a clear idea of how this process takes place. In the film, the dream place looks like a vast African landscape, but it is in reality a much smaller set that has been expanded with digital effects. When filmmakers are shooting scenes that take place at night, working inside a studio lets them have much better control of the lighting conditions. 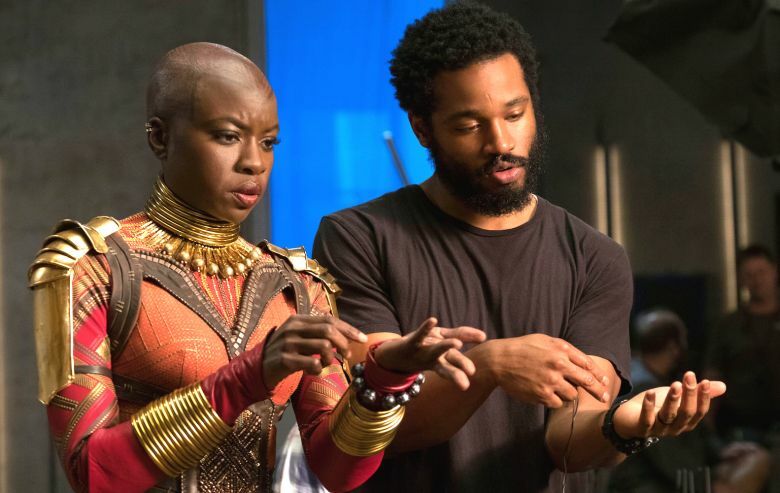 This picture captures Coogler teaching Danai Gurira how to use Wakandan tech. The technology consists of a bracelet with several large round beads made from Vibranium sand. The beads, known as Kimoyo beads, have many different functions. In the photo, Gurira is practicing how to use the Kimoyo beads for communication. To communicate, a bead slides into the palm of her hand and creates the image of the person she is speaking to. The idea behind this technology comes from the science of acoustic levitation. Acoustic levitation explores how sound waves can be used to create shapes. This technology has been explored in real life at the University of Tokyo and served as inspiration for the tech in Black Panther. While they are undercover in the casino, one of Ulysses Klaue’s henchmen sees through Okoye’s disguise. A fight immediately breaks out between the two and audiences are treated to Gurira’s most memorable performance in the film. In the first seconds of the fight, several aspects of Okoye’s character are revealed. Ryan Coogler envisioned Okoye to be a traditionalist and her fighting style reflects this trait. She is also a proud general of the Dora Milaje and her bald head symbolizes her dedication to this calling. 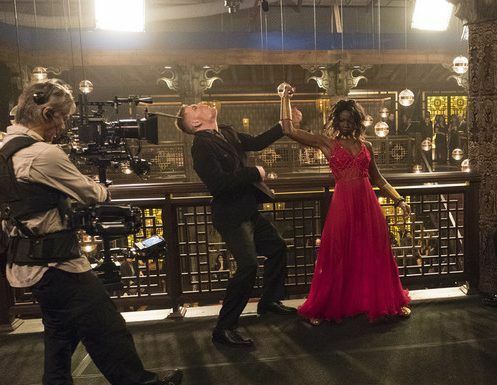 The moment the fight breaks out, Okoye cannot pull her wig off fast enough. The move became an instant gif. This photo shows a friendly and relaxed moment in between takes. When you think about the thundering pace that usually drives a Marvel movie, it is easy to forget that long days of shooting often are interspersed by peaceful moments of friendly chatter. In this picture, it is easy to see that the director enjoys spending time with his cast and engaging them in discussions. While discussing his upcoming directorial debut, Michael B. Jordan explained that he learned a lot from working with Coogler. 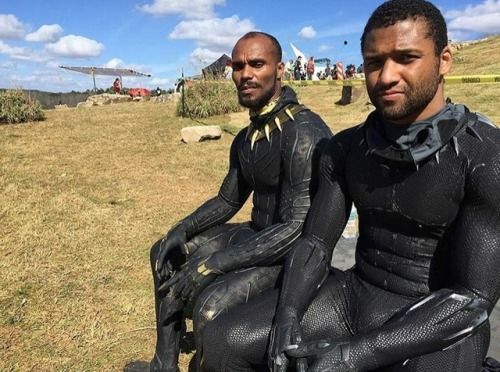 Another innovative aspect of Black Panther is the type of stuntmen the film has employed. The style of stunts performed during fight scenes goes by the name of “tricking” and is a combination of martial arts and acrobatics. Daniel Graham, reigning world champion of tricking, often acted as Chadwick Boseman’s stunt double. His stunts are on display in the final battle between T’Challa and Erik Killmonger and in the fight against a convoy of smugglers. This picture shows two other stunt doubles hanging out on a nearby rock. When he developed the looks for Black Panther, makeup artist Joel Harlow looked to Africa for inspiration. The lip plate ornament presented in this picture came from an Ethiopian tribe known as the Mursi. 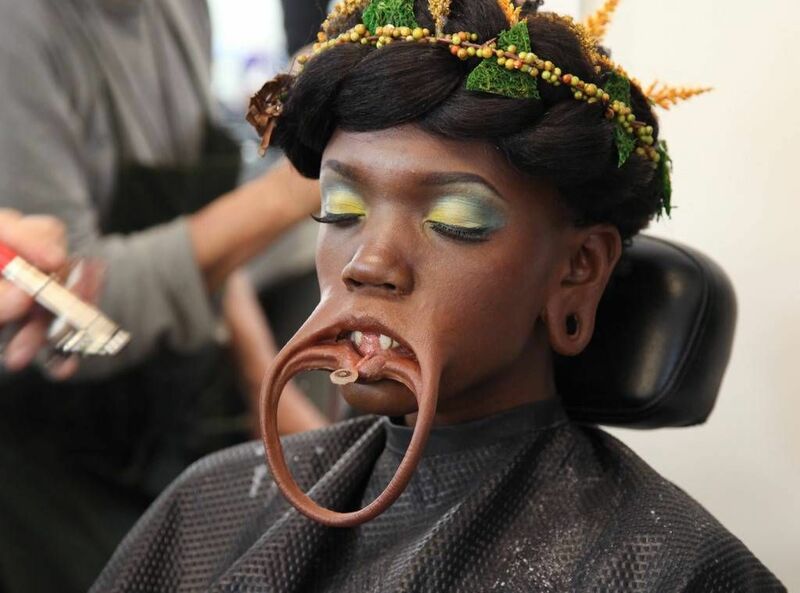 The Mursi attach the ornament to their faces by removing four teeth from their jaw. This was obviously not an option for Harlow, so he had to find another way to attach the ornament. The solution was a magnetized mechanism that stuck to a cast of the actor’s teeth. Unfortunately for the actors, they could not eat while they had the plate in place. 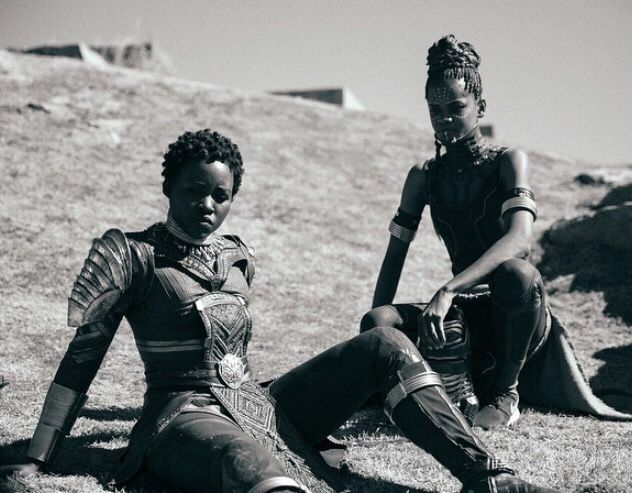 In this behind-the-scenes photo, Lupita Nyong’o and Letitia Wright enjoy a tranquil moment in between shooting. Their costumes might not look comfortable to lounge around in, but they were softer than they appear. Even though it looks like metal, the armor is actually made of rubber. The same also goes for all the chunky necklaces and bracelets worn by the women in the film. The two heroines were fortunately also spared the female superhero wedge and are sporting flat boots fit for a fighter. Birnin Zana is the capital of Wakanda. 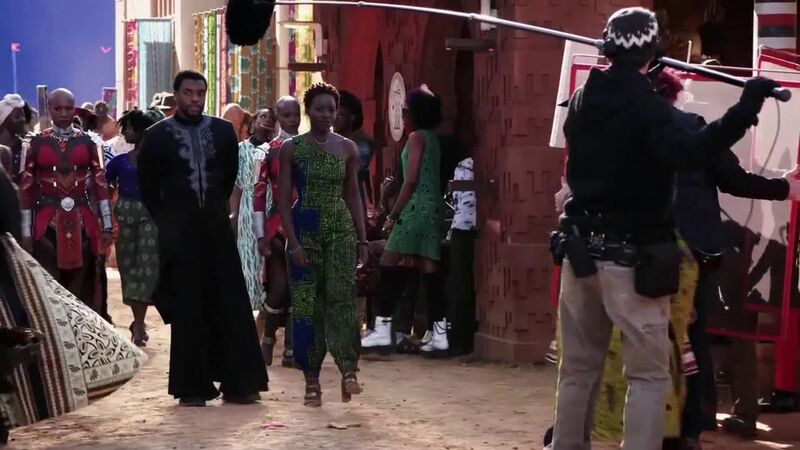 In this scene from the movie, T’Challa and Nakia are walking through the streets of the city’s ghetto. As you can tell from the photo, the Dora Milaje are sticking close by so they can protect their king. 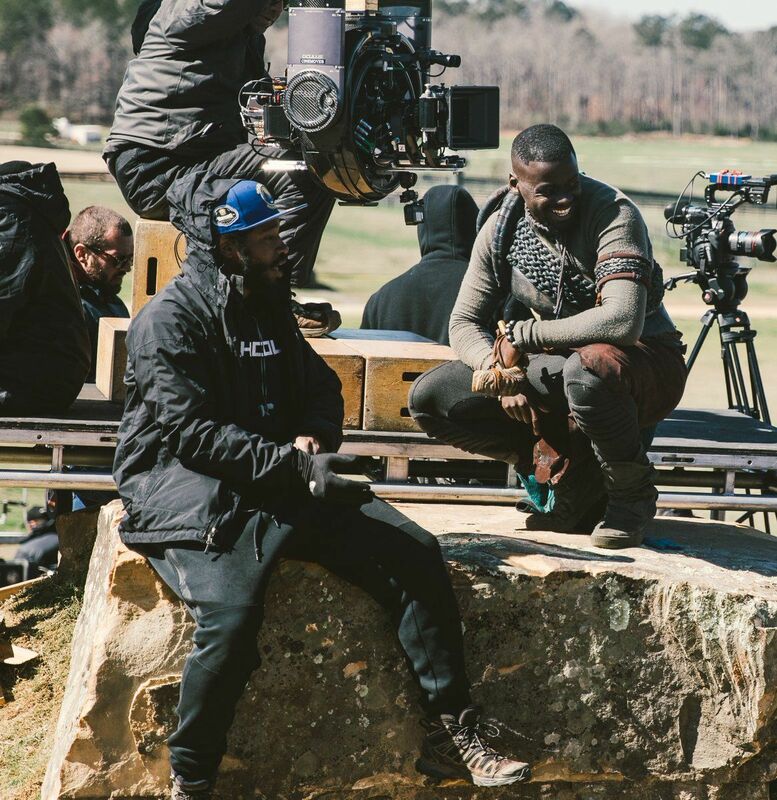 In her preparation for the film, production designer Hannah Beachler created a 400-page book of Wakanda’s history. Through this extensive research, she knew how to map out all the streets of Birnin Zana so that they would be alive with the same amount of history as any other city. This electric black and white photo published by Vice shows the cast and crew huddling together on a day of shooting. 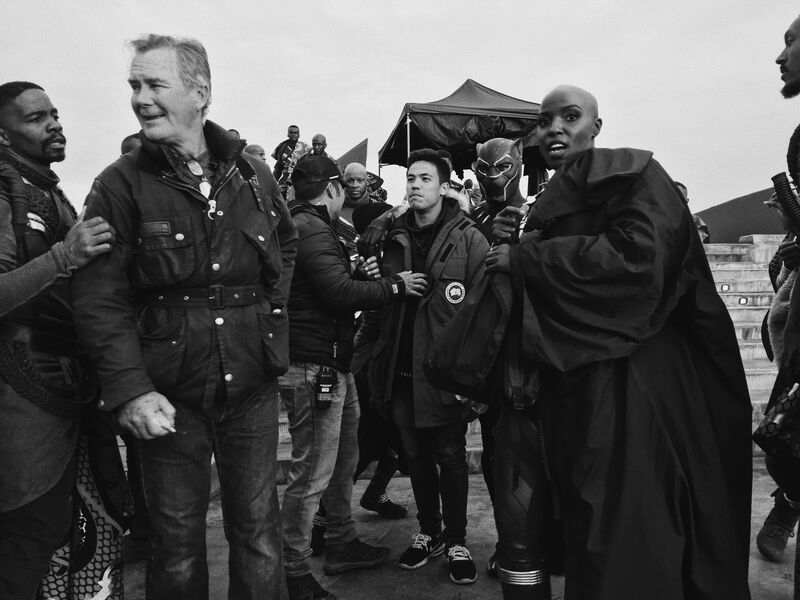 In the foreground, you can spot one of the Dora Milaje heating up under a large black coat. The Dora Milaje is a group of female soldiers led by Gurira’s character Okoye. This military unit was first introduced in the Black Panther comics in 1996, but their origin goes back much further. The Dora Milaje are inspired by a group of female African bodyguards and soldiers called the Dahomey. The Dahomey warriors protected West African kings from the 17th century up until the end of the 19th century. In this photo we can see how the crew acquired on-location footage for the car chase in Seoul. A camera is hooked to a crane on a black SUV and a stuntman is clambering to the roof of the car. In the driver’s seat, you can make out the silhouette of someone driving the car. This sequence was filmed in the seaside city of Busan in South Korea. Several of the city’s famous landmarks, such as the Gwangandaegyo Bridge, make an appearance during the chase. Coogler has stated that he was drawn to the city because of its great night view and traditional Asian environment. During the film’s press junket, actor Andy Serkis shared a surprising story from the making of Black Panther. At a certain point, Coogler had told him and his colleague Martin Freeman that he had never directed two white men before. Freeman also shared that he quickly realized that he was a minority on set for once. However, from this photo it looks like he took to the experience like a duck to water. His stint in the drum circle would not be the last time Martin Freeman let the rhythm take him over. Sometimes, acting as a titular character can be tiring and confusing. 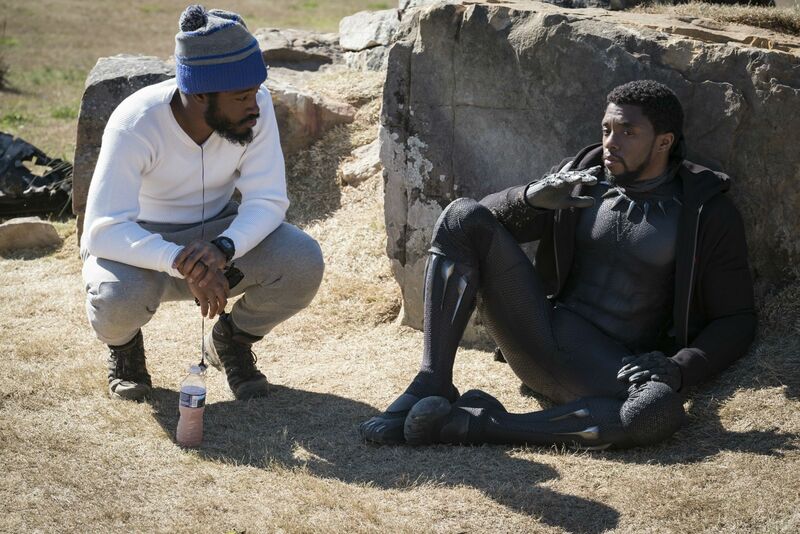 This snapshot from one of the days on set captures Chadwick Boseman reclining against a rock and engaging Coogler in conversation. Boseman has described his relationship with Coogler like a “good marriage“, and this might be a moment where they were clearing up a misunderstanding or figuring out the best way to achieve their vision. There have already been murmurs of a Black Panther sequel, so it is a good thing that this actor and director have a solid foundation. Black Panther is filled with amazing stunts and action sequences. This photo shows how a little bit of South Korea was brought back to the studio in Atlanta to get the final touches of the car chase just right. 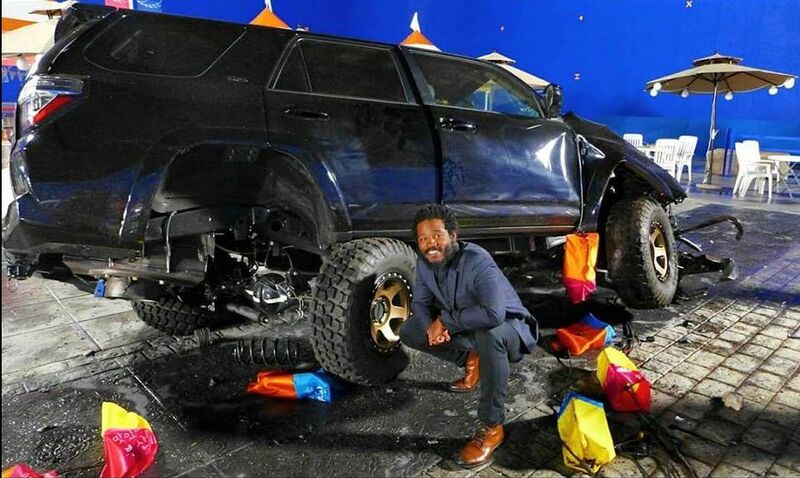 When he conceptualized the sequence, Coogler set out to make a car chase unlike anything audiences had ever seen. The scene is a great example of how Black Panther plays to the strengths of its individual characters and their underlying Wakandan spirit. Coogler most certainly achieved his goal of making an unparalleled and innovative action sequence. Unlike many other superheroes, Boseman was offered the role of the Black Panther without ever having to audition. When he went on to become the breakout star of Captain America: Civil War, Marvel took notice and focused its resources on producing a high-quality Black Panther film. The ongoing project would peg the Black Panther as Marvel’s equivalent of James Bond. In this photo, Boseman demonstrates how his character gives Bond a run for his money. Although the Black Panther shows much greater respect for women, he shares Bond’s rugged yet suave demeanor. One of the recurring themes in Coogler’s cinematography is the question of identity and figuring out who we are. Before he started working on Black Panther, the director took a trip to Africa to explore these questions on a personal level. 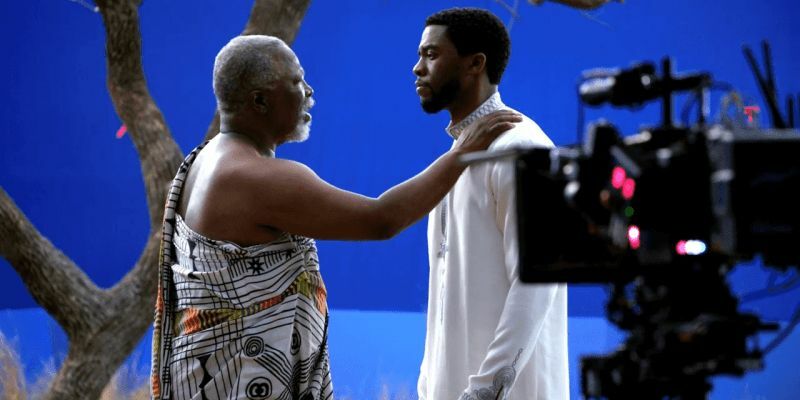 In the film, T’Challa finds himself in a dreamlike place where he encounters his deceased father in the form of a panther. This scene is an important part of his journey to figure out where he belongs in the world and to find his place as the ruler of Wakanda. While fight scenes look riveting on screen, making them is often like piecing together a puzzle. This photo reveals how awkward the footage can look before it is perfected through the magic of montage and visual effects. Nonetheless, the sequence came out looking seamless in the finished product. Audiences who crave more of Black Panther‘s impressive stunts will not have to wait long. The film’s fight coordinator, Clayton Barber, has been hired to work on the second season of Netflix’s Iron Fist. Before Black Panther hit theaters no one could have predicted the massive impact it would have. When this photo was taken, Boseman was—perhaps unwittingly—already on the way to becoming a bona fide movie star. For many of the actors involved in the film, the experience has undoubtedly changed their lives forever. In an interview with the Today Show, Boseman described the fans’ reaction to him as akin to being one of The Beatles. These behind-the-scenes photos document the last months before the film’s cast would skyrocket to global fame. What’s your favorite thing about Black Panther? Share your thoughts in the comments!